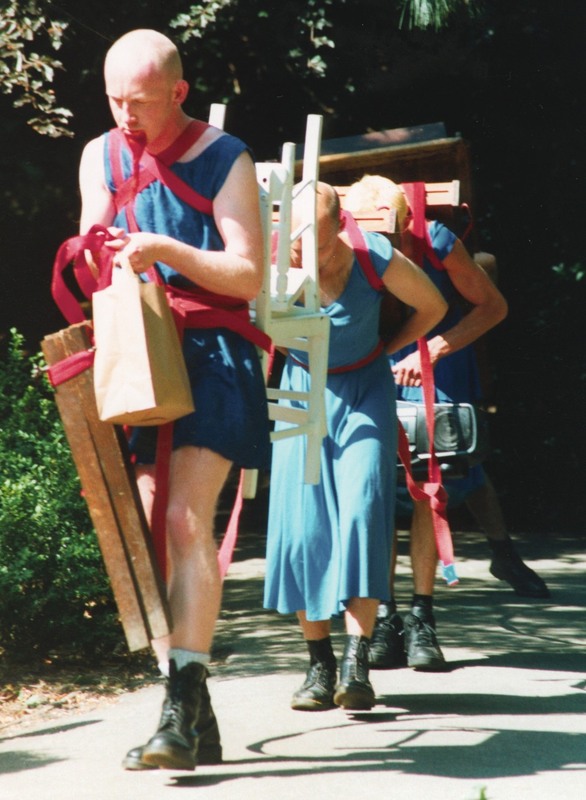 The Five Andrews have been making and performing work since 1990. We'll be illustrating this history by adding more photos, galleries, documents and media to this page. Most of The Five Andrews, including their friends, are still writing their PhDs. A performative intervention in the form of a fashion show celebrating 25 years of costume design by Andrew Barker for The Five Andrews, and the 50th birthdays of Andrew, Satisfaction by The Rolling Stones and My Favourite Things from The Sound of Music. Private event. Already? Can't we slow this thing down? General consternation at a surfeit of content. Sense of duty to civilisation to stop adding to the global content mountain. So wll kp it shrt. October. A 50th birthday piece for our friends Leah and Nigel: on a planet light years distant, signals from the televising of The Supremes' first arrival in London, England, Earth, are spied through a gap in the neighbours' curtains and interpreted by a team of alien cultural experts. Subsequently, after a long journey, emissaries arrive by taxi on planet Earth to confirm their findings. Private event. Every few years the fields of the lemonly realm are left fallow for replenishment of nutrients. Restive Five Andrews are herded up by artist Charlie Murphy and given exercise as pantomime ponies. 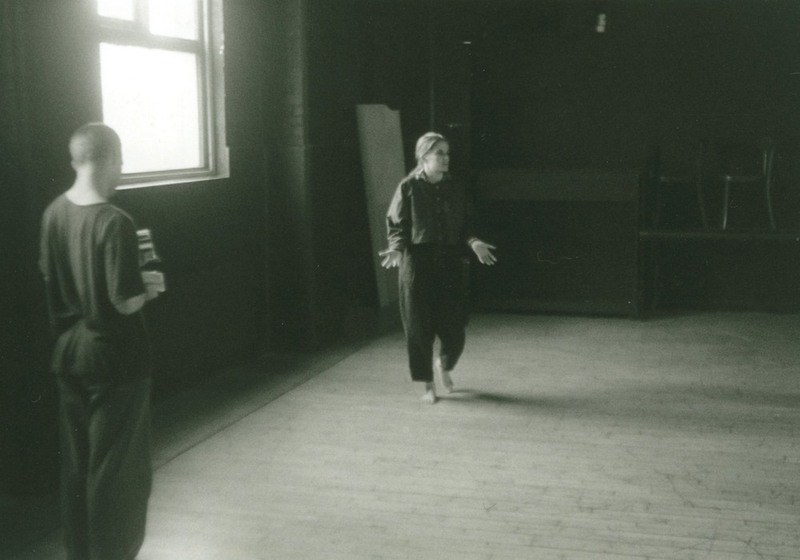 16 February - Performance of swan at Chisenhale Dance Space, this time joined by Nic Sandiland, as part of a tribute celebration of Charlie Meyrick. 8 December - Wishful minment at Greenwich Dance Agency's Christmas Cabaret. 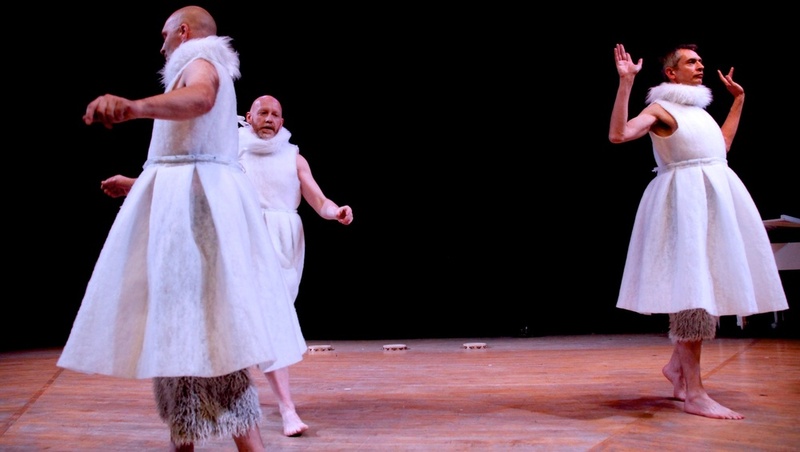 Andrew Barker and Kate Brown demonstrating 'swan' costumes. 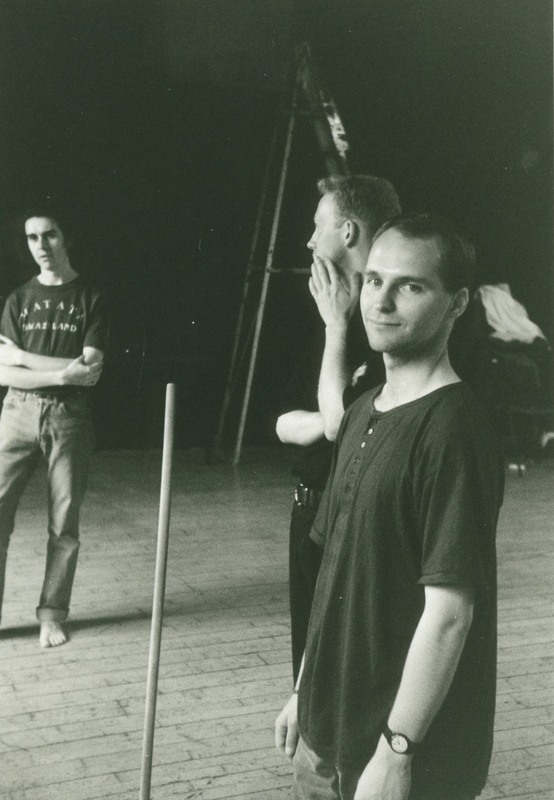 30 July - swan structured improvisation: Andrew Barker, Andrew Downs, Kate Brown perform swan made in memory of Charlie Meyrick and directed by Kate Brown. 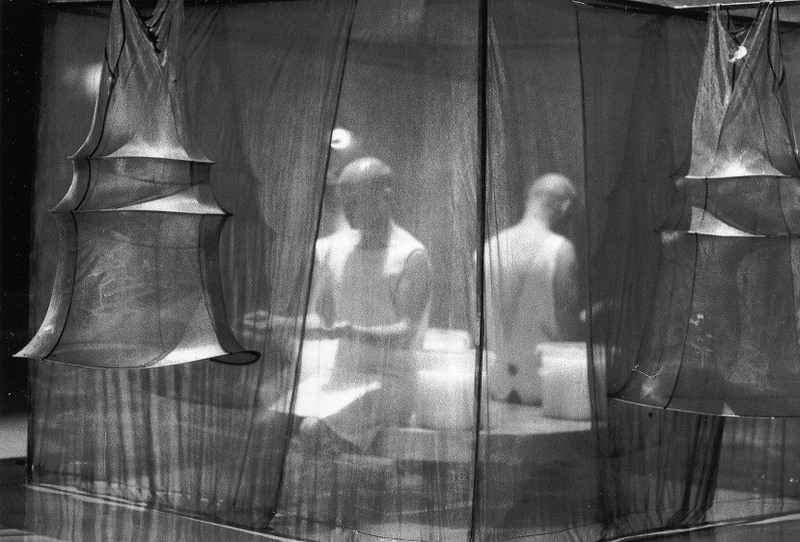 Part of Stranger than Fiction at Siobhan Davies Studios. 23 October - We sit reversed astride our hired horse structured improvisation as part of evening hosted by soFt at Chisenhale Dance Space. With guest performer, choreographer Kate Brown. 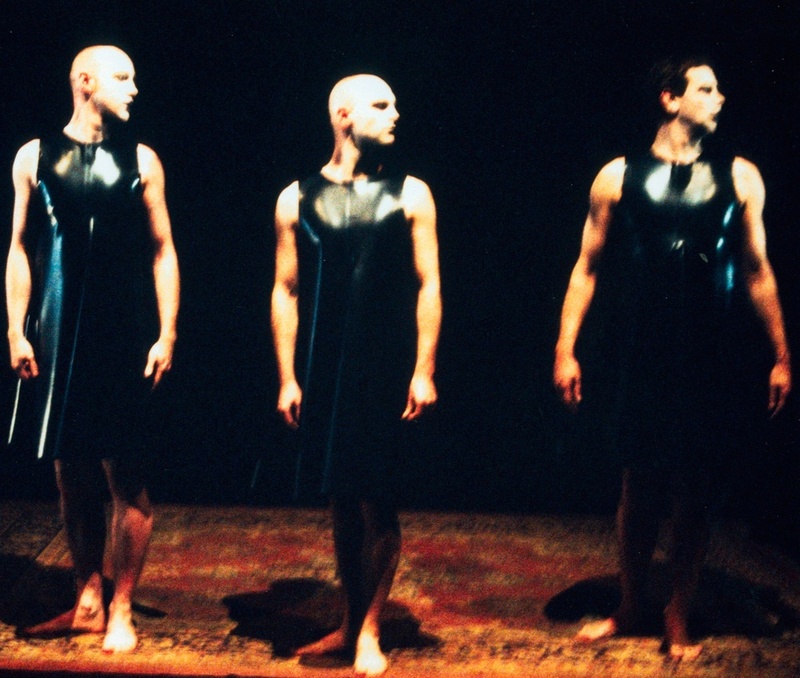 Members of The Five Andrews appeared in choreographer Kate Brown's retrospective at Toynbee Hall. 12 April - Twin works Forfar and Fife performed as part of independent event Bricolage at Chisenhale Dance Space, East London. 24 June - Premiere performance of twin works Forfar and Fife made for the Rebecca Skelton Fund event at Ditchling Village Hall, East Sussex. 11 February - The Garden of Wrong at The Place, London. 25 May - The Garden of Wrong at Chimera, a group visual art show at a gallery in St John's Street. Clerkenwell, London. 15 July - Pneu. A five minute improvisation directed by Kate Brown. A London Improvisation in Performance presentation at 'The Small Dance' at Greenwich Dance Agency. 'The Five Andrews request you leave your judgment in the jar at the door, along with theirs. Don't forget to put your name on it. In this 25 minute presentation The Five Andrews describe key ideas that have informed their work over the last 16 years which they had, at the time, the good judgment to bin. 8, 9 December - Dunkel at 'Christmas Cabaret', Greenwich Dance Agency. The Five Andrews perform a new work Dunkel as part of the GDA Christmas Cabaret. 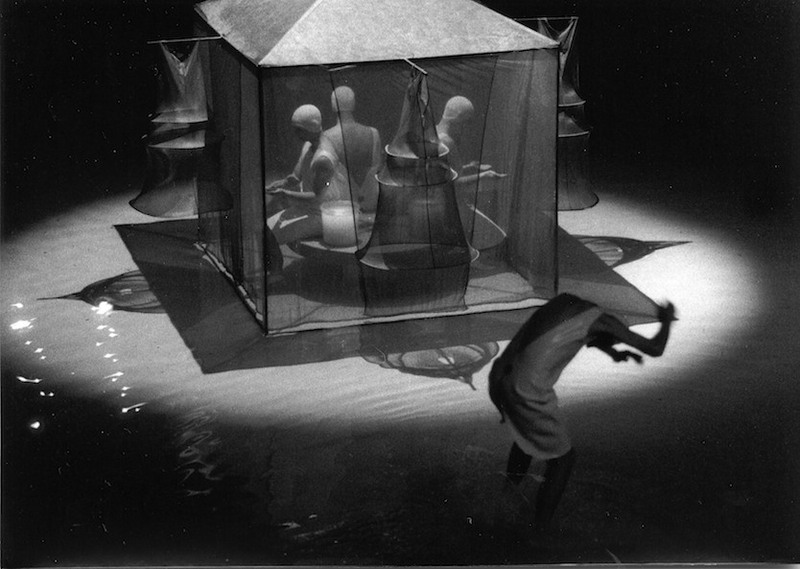 A still from the performance appeared on the front cover of Autumn 2007 edition of 'Animated' magazine. Listen to Dunkel's festive soundtrack, with original material created by multitracking on 2 track domestic tape recorders. July The Garden of Wrong at Stromereien (Zurich, Switzerland) designed as a site-specifc work and performed in a disused brewery. 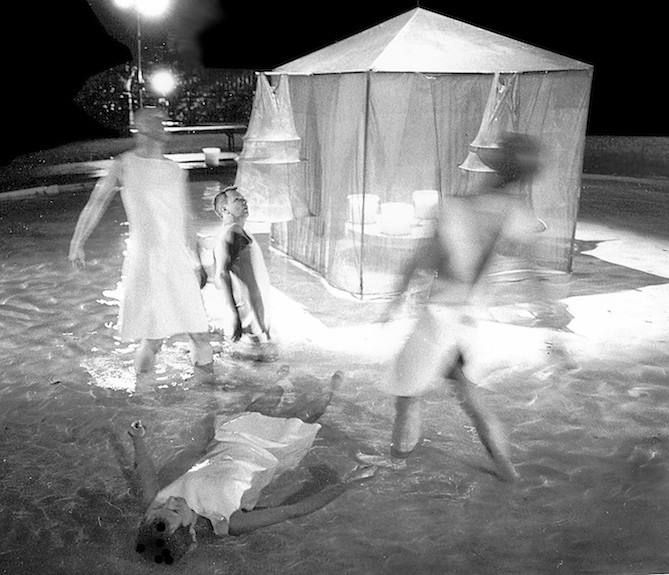 Photos of The Garden of Wrong by Paul Sewell, Christian Glaus and Andrew Downs. We selected for this occasion two of our sporadic, ritual-like and perplexing performances, Sicut and Mem. ; the one inspired by body fluids bile and lymph, the other by a cyclical absence. Still from 8mm film 'Sprue' . Photo Linh Tang. 8 October - IF_PERCH Invitation Event with The Five Andrews and Rajni Shah at Curtain Theatre, Toynbee Hall, London, E1. The Five Andrews performed Sicut. 1 November - Sprue - filmed by Andrew James - a one minute stop-frame Super 8 film inspired by stop-frame photography of plant growth screened under the category '1 minute wanders' , part of Dance on Screen at The Place Theatre, London. 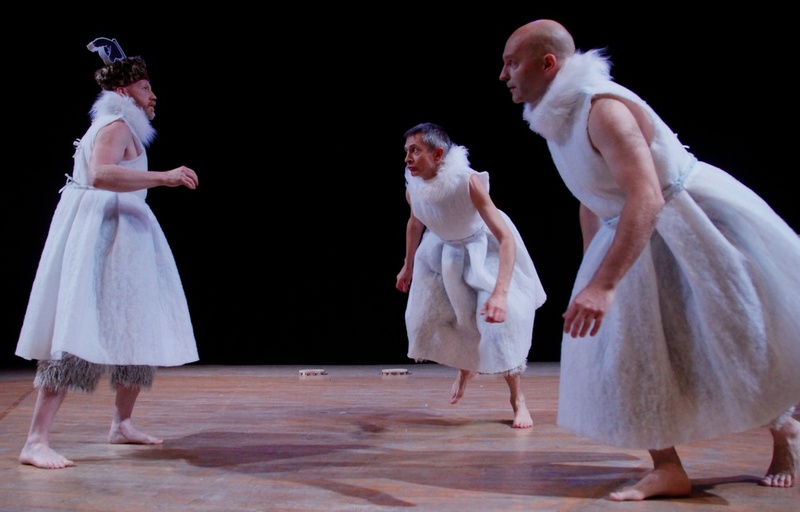 Chefs d'oeuf, performed at Chisenhale Dance Space, a sharing at the end of our period of artist development workshops with invited directors Thomas Kampe and Ernst Fischer. On the way to mem. a work in progress showing in preparation for Mem. Again at Chisenhale Dance Space. Mem., and Sicut, dir. 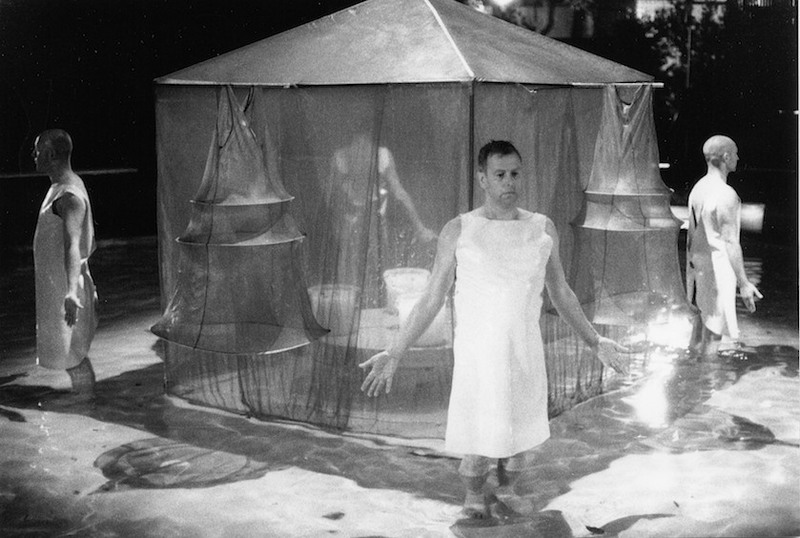 Andrew Barker, performed at Chichester University. Publicity image for Sicut. Photo Kim French. Sicut, dir. Andrew Barker, peformed at The Place Theatre, London. Metaphysics as a guide to table manners, performed at 291 Gallery, Hackney. Corps, dir. Andrew Barker, performed at The Place Theatre, London. Obstinate Choices, dir. Andrew Barker, performed at The Place Theatre, London. Charlie Meyrick in costume designed by Andrew Barker for Vessel. Vessel, dir. Andrew Barker,first performed at The Place Theatre, London. Also performed at Buoy-o-lux festival at Trinity Bouy Wharf, London. Un Citron Andalou, performed at Buoy-o-lux festival at Trinity Bouy Wharf, London. More Light (in a contingent garden) dir. Andrew Barker, performed at Morley College, London. Un Citron Andalou, performed at Waterlow Park, Highgate. Travelogues from the Unfolding Curve - dir. Nic Sandiland. Performed at Highbury Roundhouse. The Red Queen - dir. Nic Sandiland asst by Ed Birch. Performed at Chisenhale Dance Space, London. The Silent Moon - dir. Andrew Barker. Designed for site-specific performances at Camley St Natural Park, Kings Cross and adapted for performance at Chisenhale Dance Space, London. Un Citron Andalou, first performed in a Brixton nightclub. 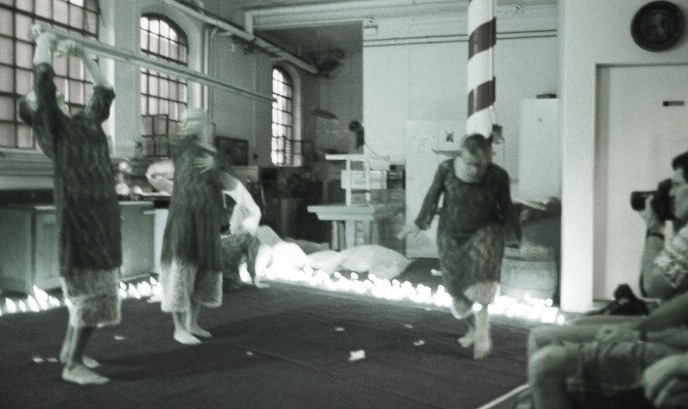 Fugitive Traces - dir, Andrew Barker, Performed Chisenhale Dance Space. Warmer - dir. Andrew Downs. Performed in the squash courts at Tottenham Green Lesiure Centre. A short film made on Rhodes - untitled & unpublished super 8 film project. Warmb - dir. Andrew Downs. Performed at Arthaus, Turtle Keys, London. Ladies' Fingers - dir. 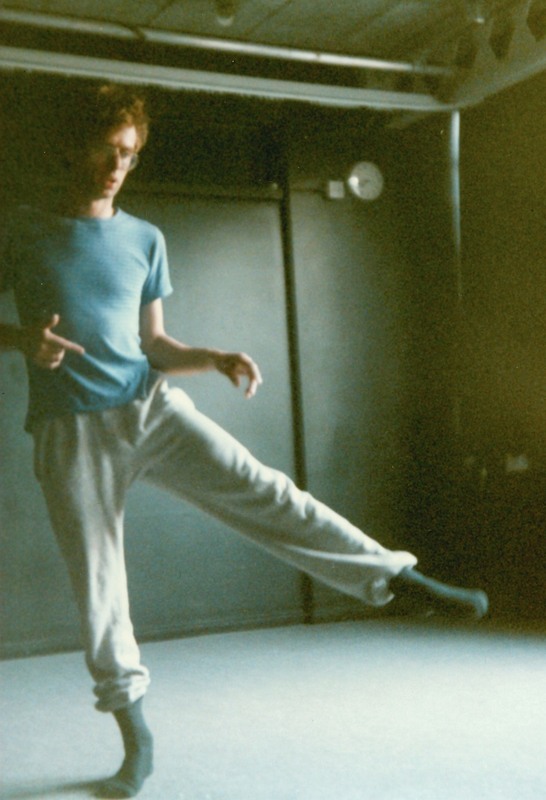 Andrew Downs, performed at Chisenhale Dance Space, London. They also serve who only stand and wait (including my grandmother never told me life would be like this, otherwise to be known as a new way to play old spoons) - performed at Arthaus, Turtle Keys, London. Tembea - improv performed at Islington Arts Factory. A Weekend in Wales - group workshop at Mother Nature, Sandersfoot, S, Wales. The Lions of Yesterday and Today - dir. Nic Sandiland Performed at Chisenhale Dance Space, London. 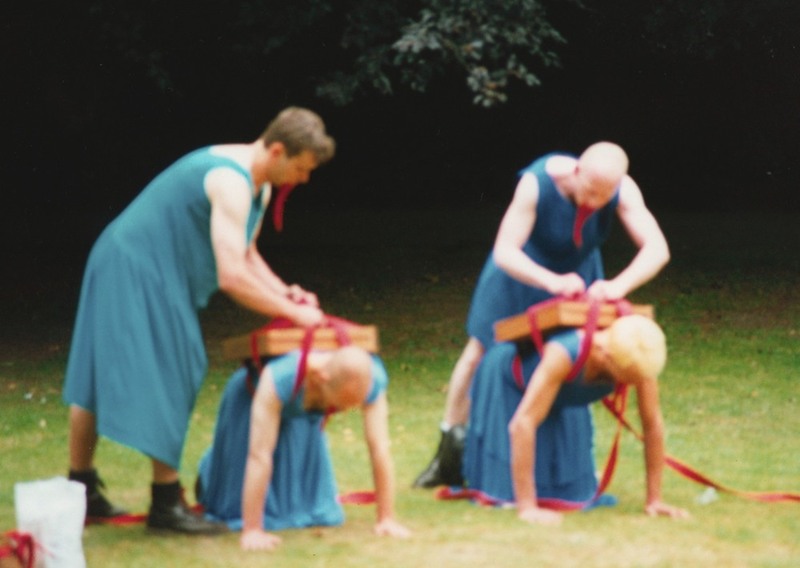 Groundwork - Inaugural work from The Five Andrews - performed at Dartington College's London studio in Rotherhithe, and at Chisenhale Dance Space, London. The Colour of Silence - dir, Andrew Barker, performed at Chisenhale Dance Space, London. Soundscore text - and title of this work - taken from White Nights and Matrix and Dreams by Paul Auster, read by Charlie Meyrick. 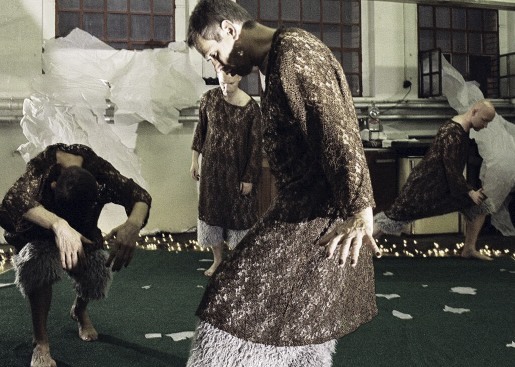 Chaotic Behaviour - dir, Nic Sandiland, performed at Chisenhale Dance Space, London.